a. Splice PTO. drive the gear oil pump to rotate, delivers a high-pressure fluid flow to the sandwich multiple control valve, which consists of a amplitude cylinder control valve (up and down), a hydraulic winch control valve (towing and release), a folding-arm cylinder control valve (retraction and release), an telescopic cylinder control valve (extension and retraction) and an relief valve, all connected in parallel. The setting for the relief valve is 16 MPa. When the pressure in the system is above this setting, the relief valve will open automatically so that the high-pressure fluid flows back to the tank through the valve and return pipes. On one side of the directional valve is installed a manual throttle valve, which controls the speed of the engine, so that the action of all the systems can be controlled at a desired speed. b. When the handle of the amplitude cylinder control valve is pushed to the “up” position, the piston levers of the amplitude cylinders are extended to push up the amplitude arm, so that the amplitude is elevated. When the amplitude cylinders elevate fully to the rated stroke, the high-pressure fluid flows back to the tank through the relief valve and return pipes. Vice versa, when the handle of the amplitude cylinder control valve is set to the “down” position, the piston levers of the amplitude cylinders are pushed back to pull down the amplitude arm, until it reaches the original position. Then the high-pressure fluid will flow back to the tank through the relief valve and return pipes. 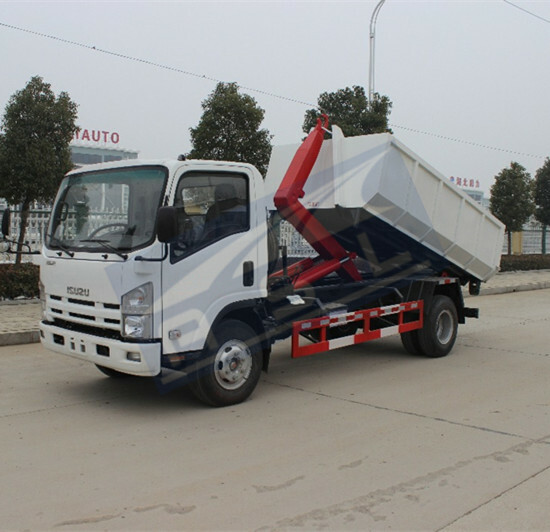 c. A balance valve is installed on ISUZU RHD Roll Back Trucks between the two amplitude cylinders. It serves to adjust the pressure between the two cylinders and keep them at balance. It also works as a safety device, when the delivery or return pipes accidentally break at a time when the amplitude cylinders are elevating or dropping, it can automatically lock the system to prevent the amplitude arm from dropping down drastically under the sudden action of a load. d. When the handle of the folding-arm cylinder control valve is set to the “release” position, the piston lever of the folding-arm cylinder is pushed back, so that the folding arm rotate from the vertical to the horizontal position and drop down. Vice versa, the folding arm and the extension arm are folded. The telescopic cylinder works in the same way as the amplitude cylinder. a. The winch is driven by a hydraulic motor through high-pressure fluid. When the hydraulic motor is working, it is possible to release the steel cable automatically when the handle of its control valve is set at the “release” position or to pull back the steel cable and start towing when the handle is set at the “towing” position. b. 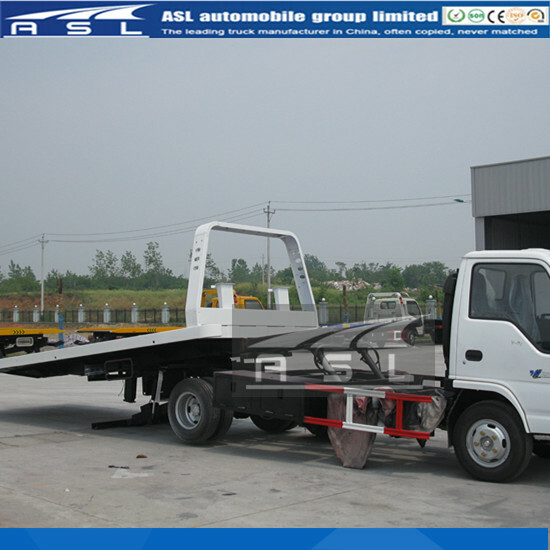 It is also possible to do the towing with a towing lever. 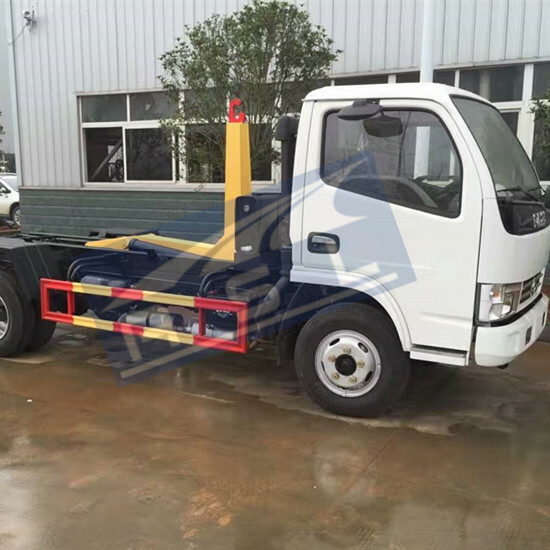 To do this, it is necessary to install the rear-towing hook on the hydraulic wrecker. The towing lever should be securely connected (Or fixed with the socket) between the wreck and the tractor. <!--[if !supportLists]-->a. <!--[endif]-->Tire bracket can be used when it is necessary to tow small vehicles. There are front and rear tire supports. The front tire bracket is fixed transversely between the holes on either end of the telescopic arm and retained with pins. The rear tire bracket is inserted into the square hole in the front tire bracket and fixed with a pin. The tires can be locked tightly with chains and tightening locks. b. The switches for the alarm lamp and the alarm are installed in the cabin. The switches of the lights for the alarm lamp stand are installed in the control cabinet. c. The attachments should be put back to their respective positions in the toolbox after they are used, so it will be convenient to use next time. 1: The correct working technique is that you get twice the result with half the effort, and practice makes perfect is just the key of raising efficiency. (1) Pull out Pneumatic switch or mechanical handle of PTO, now the PTO is in mesh and will be able to drive the gear pump. (2) Fix the steel cable securely and reliably onto the tractor at a proper position with a chain or a tightening lock. (The fixing area must be strong enough and at the same time will not do damage to the other components). (3) Try to make the steel rope keep in the same level, and control the traction speed through hand throttle. (4) Constricting the steel rope, pull the tractor to the safe, appropriate position of the platform, do not untie the steel rope, chain or tightening lock on the tractor. 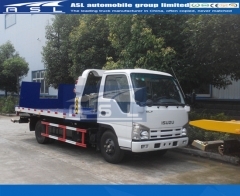 (5) Shut PTO on 3T Light ISUZU Lift Away Platforms. (1) Drive the tow truck to a suitable position; be in a line with the tractor. (2) Splice PTO (operation as former). (3) Operate the platform lifting cylinder so that the platform is lifted to the proper position. (4) Extend the platform telescopic cylinder to the suitable position. 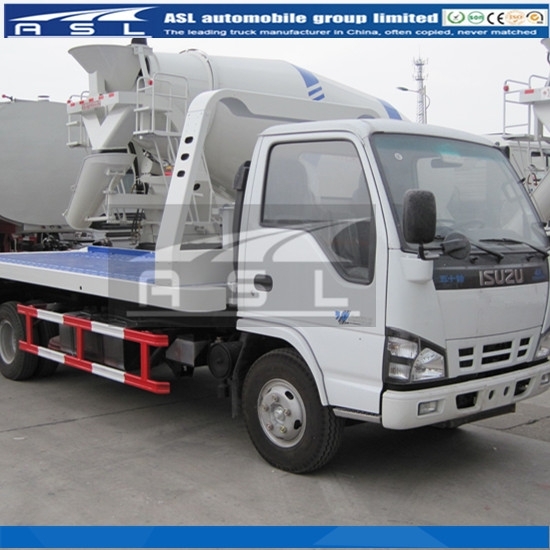 (5) Adjust the platform lifting cylinder so that the rear of the platform can touch the ground fully. (6) Start the speed-up setting of the hydraulic winch and then pull the steel cable down to the towed vehicle. 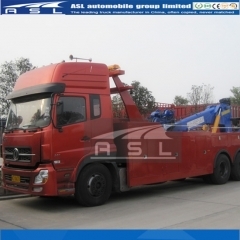 It is very import to fix the hook to a proper place in the chassis of the towed vehicle, i.e. to the pullback of the bumper or the front bridge. (7) Turn off the speed-up setting of the hydraulic winch. 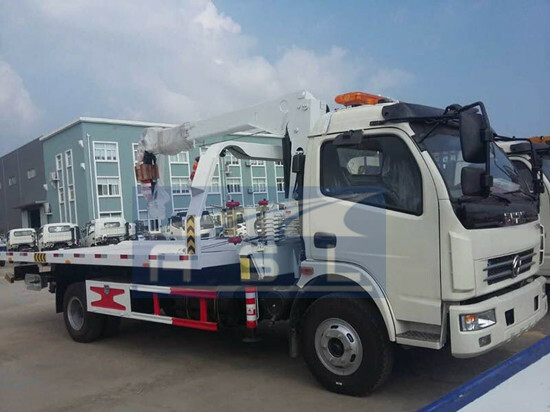 With the hydraulic winch operated, the towed vehicle safely and reliably to the proper place on the platform. (8) The platform cylinder falls slightly so that the back of the platform is above the ground. Also the platform extension and retraction cylinder will retract fully enough and another platform cylinder will lower the platform to its original position. (9) Fix tightly four tires of the towed vehicle with tightening equipment. 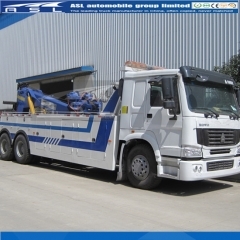 Make sure that the vehicle is safe when it is towed, even in the following situation: at the moment there is a sharp turning, shock, bump, acceleration or sudden braking. (10) Carry out the hand brake of the towed vehicle or set its shift lever to the idle position. (11) Turn off the power take off( P.T.O.) in the same way as described before after all the preparations are finished. Now the gear pump stops working. Start driving and towing the vehicle at a speed not greater than 40 km/h. (3) Put folding arm to the lowest position. 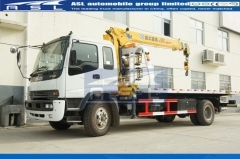 (4) Extend the telescopic boom to the front of the towed vehicle. (5) Put the back bracket of tire insert into square hole of the front bracket, and clamp the tires. Fix the front bracket with pins. ( If hydraulic automatic models，control the folding-arm cylinder directly by the multi-route directional valve in order to clamp the tire automatically). (7) Release the hand braking of the tractor, put speed shifting lever in neutral gear. If the tractor be uplift from the back, the steering wheel should be set do not let it change direction. (8) Hoist the tyre bracket by operating up-down cylinder, so the tyres of the tractor should be over the ground about 300mm. (9) Shut PTO(operation as former),running by tractor, the speed should be with 40km/h. (10) When arrived at certain position put down the tractor and reset all parts. (1) Even the best products have left your meticulous care and correct regular maintenance, it would not have lasting vitality. In order to make good use and well safeguard of your vehicle, please operate and maintain according to the following methods. (2) Check the hoisting or pulling system and the attachments from time to time to see if there is any damage or loosening. (3) For the special units, grease should be filled at all the lubrication points every month or after being used 250 times. (WUXI 3# lithium-based grease should be used). No grease should be applied to the piston levers in the hydraulic cylinders. (4) Extract all the steel cable out of the winch once a month and clean it with engine oil. 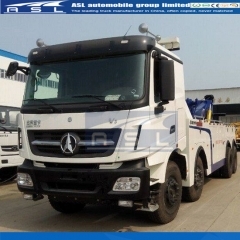 (5) Hydraulic oil of new vehicle should be replaced not longer than half a year for the first time. After that, the fluid can be replaced when it is found contaminated or aged, but not longer than a year at most. (6) Hydraulic system must be provided with prescribed hydraulic oil. The brand is YC-N46 or YC-N68 low congealed hydraulic oil (The old brand is NO.30 or NO.40 hydraulic oil). (7) The gear pump should be running at low speed at the time of filling the hydraulic fluid, so that the extension/retraction, folding and amplitude cylinders move to and fro two or three times and the hydraulic winch rotates about two turns, to make sure that the air entrapped in the hydraulic system is completely driven out through the bleeding hole in the tank cover. Finally, the fluid level in the tank should be kept between the top and bottom limits specified with the scale marks. It must be stressed that the filling must be done through a filter with a mesh not smaller than 25μm. (8) The enter/exit filter of the hydraulic tank is equipped with a pressure gauge. The pressure gauge is normal when indicator points to green and yellow, on the contrary, its need to wash or change the filter element when indicator points to red and send out alarm chirping. 1. 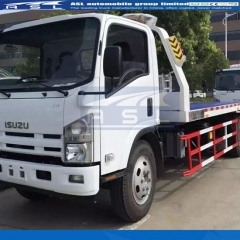 Fasten and leave the relief valve on Diesel ISUZU 6wheels Flatbed Trucks with 30-opening spanner or double offset ring spanner. 2. Stop up this mouth with the clean gauze, In order to prevent the oil from overflowing in a large amount. 3. Clean up the squalidities in the place that the arrowhead points. Carry and press the position that the tip means in the picture with the cross arises(inner spool), reciprocate it many times, and add a little hydraulic oil, until discharging the impurity from the ventage(as the arrowhead points in the following picture), now it should not leak gas to blow this tip with the mouth. 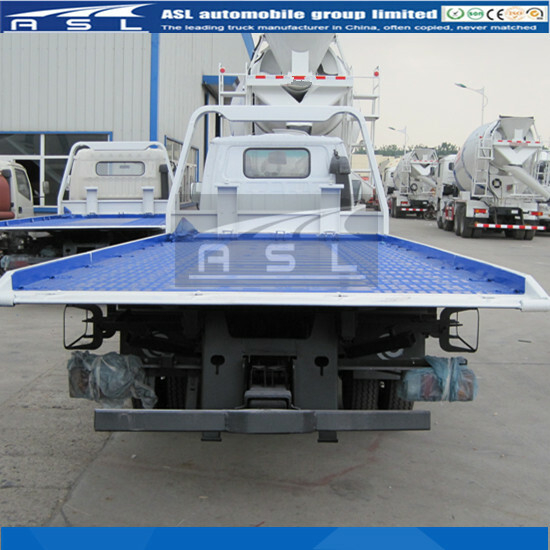 (10) For the operation and maintenance of the chassis, please refer to its instructions manual. (Note: The manufacturer reserves the right to change part of the structure or equipment without previous notice. (11) Check the valves, cylinders, pipelines and fittings in the hydraulic system carefully for any possible leakage each time before using the vehicle. If any leakage is found, tightening should be done or the seals should be replaced. 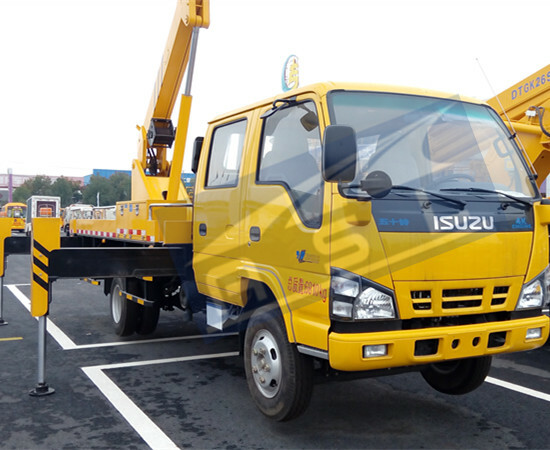 If necessary, the hydraulic components onRHD ISUZU 3T Recovery Vehicles that have failed should be replaced.